T.J. Gaffney will be the featured speaker at the February MARP meeting in Capac, Michigan. T.J. is well known to many of you as the former Director of the Steam Railroading Institute and the past Curator of Collections for the Port Huron Museum. He is the owner of Streamline Historic Services, serving as a consultant and contract historian to the museum and preservation fields. He has written articles on rail, maritime and local history and is the author of two books. The most recent is Rails Around the Thumb, part of Arcadia Publishing’s “Images of Rail” series. At our meeting he will talk about railroads and railroad operations in Michigan’s Thumb area. He will have copies of the book with him to sell and can likely be prevailed upon to sign your copy. 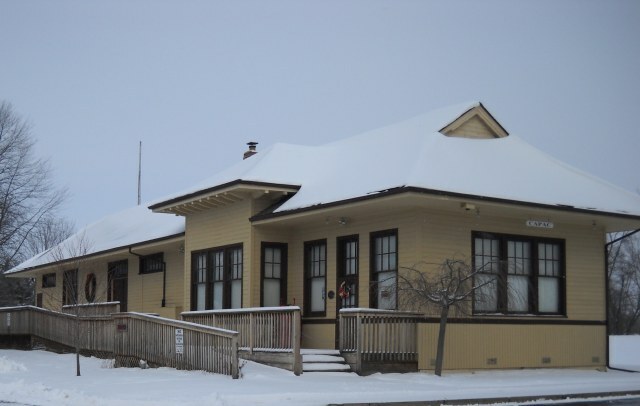 We will also hear from a member of the Capac Historical Society about the founding of Capac – does anyone else wonder about the origin of the name? – and about the work of the Society in preserving historical documents and artifacts from an area covering Port Austin to New Baltimore. John Grzyb, President of the Society, will open the museum for a brief visit. Following the meeting, we will adjourn to a local eatery for our usual “no host” lunch. Please plan to stay and join in the socializing and conversation. Capac is located between Lapeer and Port Huron, along the route of the Grand Trunk Western Railroad and Old M-21. To reach the Capac Historical Society Museum, travel north from I-69 Exit 176 on Capac Road to the second blinking light, approximately 1.8 miles. Turn right (east) and look for the small museum signs. If you would like to find someone to carpool with, please reply to this email. We’ll put you in touch with someone in your area.